Another quick and simple recipe. The most time I spent was picking the blackberries! I love the sweet and sour taste of the blueberries and blackberries together and with the sweet caramel nut and date topping. It tastes like heaven! In a food processor/blender, grind all ingredients together into a crumbly texture. Transfer to a bowl and make the filling. Transfer to a bowl and mix in the 4 cups of blueberries/blackberries Spread the mixture into the bottom of a pan. Sprinkle the crumble topping over the top. Set in the fridge for 30 minutes to an hour and serve! 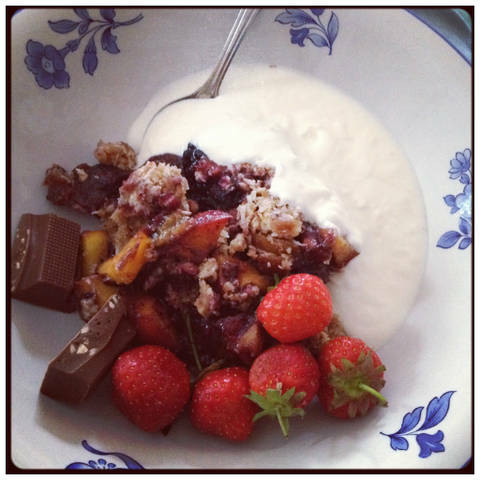 I served mine with some Coconut yogurt, strawberries and some raw chocolate squares. Yum!